The other day, I was talking to some of my teammates regarding their post-game gear-airing-out process. It seems everyone has their own routine. Some use an equipment “tree” to hang their gear. Some run a fan into their hockey bag. And some have the room to spread everything out in a basement to dry. Worst of all, others will keep their gear in the bag, zipped up, sweaty, never to see the light of day till game time. As you would imagine, I tend to make every effort to sit as far away from those guys as I possibly can. I shared my routine, which consists of unzipping my bag, spreading out the gear a bit in the garage, lifting the foot beds in the skates, and hanging the fabrics to dry. Amidst the discussion of our struggles to achieve perfectly dry and odorless gear, I blurted out, “I wish I could just have a mesh bag, always airing out.” Not surprisingly, that was met with unanimous agreement. Well, the mesh hockey bag does indeed exist, courtesy of Grit Hockey. Our test product was their 36-inch version, which came in Maple Leafs blue. The bag construction appears to be tough and durable, even the mesh portion (which most of it is). It comes with some snazzy features, such as a zip-up insulated drink sleeve to keep your water bottle and/or post-game refreshments nice and cold. 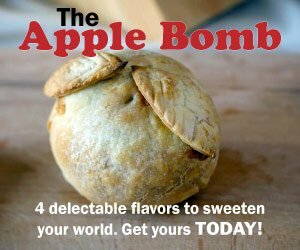 (It can fit about 2 standard-sized 20-ounce water bottles, or 4 cans, depending on your needs.) You also get a “skate mat” to store your skates on top of the bag, which helps avoid the risk of damage to the bag and aids in absorption of any melted ice coming off the blades. There is some assembly required, which was super easy: the dividers for skates, gloves, and helmet. One panel divides the bag in two horizontally, with the other panel dividing that half again–leaving you with 3 total sections (see below). Those can be removed, if desired. The whole thing took less than 5 minutes to put together. I then loaded up my gear. With all of my equipment inside, including 2 jerseys and about a gallon-size bag of accessories (tape, laces, tools, etc. ), there was still a good amount of room left in the bag for more. I am pretty average-sized at 5’8”, 185 pounds, so all of my gear falls into the medium to large range. Based on the amount of extra room with all of my stuff in there, I’m sure the bag would do well for even a bigger person with large- to extra-large-sized gear. For me, this was really the only potential drawback; the 36-inch bag has a little more room than is necessary for the average Joe. But that problem can be easily remedied by opting for their 32-inch model, which no doubt is ideal for the youth hockey player. The key function of the Grit Airbox mesh hockey bag is the improved airflow compared to a traditional non-mesh bag. I knew the only way to really put it to the test would be to play a game and see that my gear was able to dry sufficiently without any additional post-game effort on my part. I played extra hard in my first game with the new Grit Airbox mesh bag, sweating more than usual. Once I returned home, I fought the urge to unzip the bag and spread out my gear to dry. The next day I checked on my gear, only to find it almost completely dry—as if I had hung everything up for a few days pre-Airbox. (Admittedly, there was no initial change to the smell of my gear, but I am sure that over time the improved airflow will help with that as well.) Of course, the environmental conditions of where you keep your bag will determine how quickly your equipment will dry. 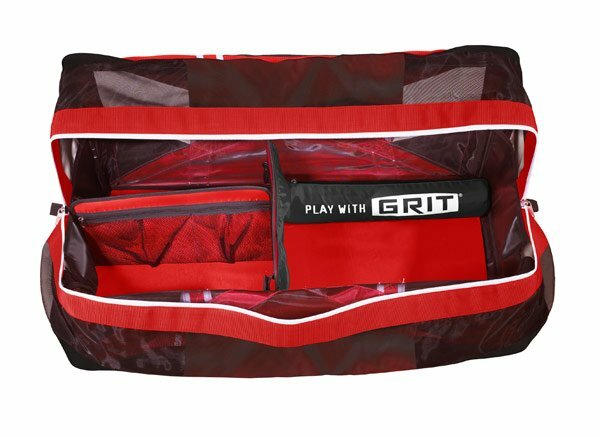 With the Grit Airbox mesh hockey bag, you get dry gear without the hassle of pulling everything out of the bag and re-packing it before each game. The constant packing and unpacking, aside from just being inconvenient, is sometimes just simply impossible; such as at tournaments or for those lacking the space needed to hang their gear. The Airbox might cost a little more than competing similarly sized hockey bags. But at the end of the day, you have to ask yourself if all of the time and energy you spend packing and unpacking your gear—not to mention the money spent on gear deodorizers—is worth the extra dough. For us, it certainly seems so! 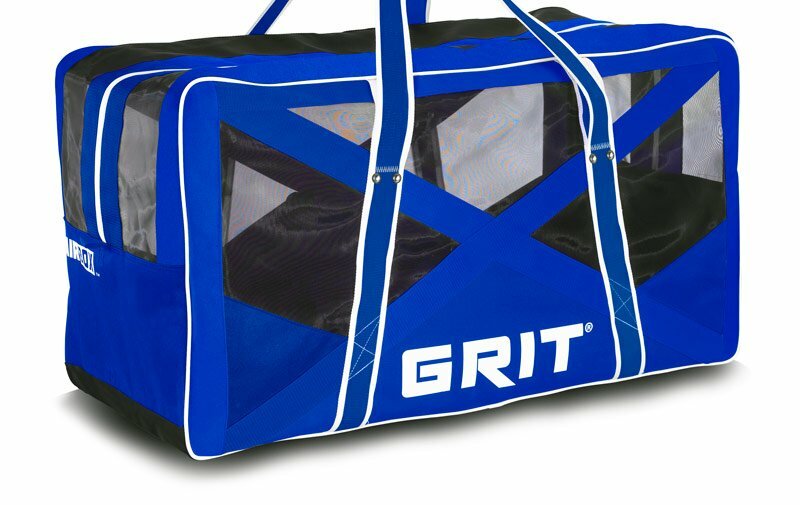 The Grit Airbox mesh hockey bag can be picked up for about $100 (plus S+H) at Perani’s Hockey World. Say goodbye to smelly hockey gear! Next articleHockey Parents Dilemma: Too Invested?